Psychiatric Report: Like Father, Like Son? Next to that clown Harry Potter, the most anticipated book this summer here in New York City is reporter Wayne Barrett's blockbuster biography of Rudolph Giuliani, the Big Apple's badass mayor. Giuliani, as you might have heard, was recently running for U.S. Senate against Hillary Clinton, but withdrew from that race following a prostate cancer diagnosis and some serious girl troubles. But TSG thinks poor Rudy was also dreading the July 11 release of Barrett's detailed examination of the controversial Republican. While Barrett's book--"Rudy! 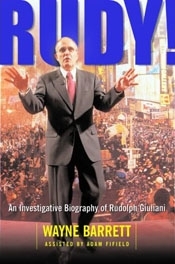 : An Investigative Biography of Rudolph Giuliani"--is a reporting tour de force filled with revelations about Giuliani, TSG will focus here on explosive details about the politician's father (currently the subject of a riveting book excerpt in The Village Voice). Giuliani has long described papa Harold as a hard-working Brooklyn tavern owner, a "complete man" who taught him the "lesson of being honest." However, in examining Rudy's family tree, Barrett discovered that Giuliani the Elder wasn't such a sweetheart. In fact, Harold was a convicted felon, an armed stickup man who once spent time in Sing Sing after pleading guilty to robbing a milkman. Sentenced to 2-5years, Harold spent 18 months in the stir before being paroled (Rudy, ironically, is a leading proponent of abolishing parole). Barrett also learned that Harold,whose rap sheet included a couple of other busts, worked as an enforcer for a relative's loan sharking operation, using a baseball bat as his enforcement tool of choice. UPDATE: In addition to the travails of Papa Harold, Barrett's book is filled with scores of other Giuliani bombshells. For instance, Rudy's cousin Lewis D'Avanzo was a stone cold gangster who was shot to death in1977 by FBI agents when he tried to run them down with his car. According to these FBI records obtained by Barrett, D'Avanzo was a suspect in several homicides and racked up quite a rap sheet. On the political front, Barrett obtained a voluminous "vulnerability study" commissioned by the Giuliani campaign during the 1993 New York mayoral race. The report's purpose was to identify--and help address--Giuliani weaknesses that might be seized on by the opposition. Rudy, of course, freaked when he saw the detailed (and quite prescient, as it turned out) report, ordering it destroyed. One copy survived, though, and landed in Barrett's hands. Here's the section on the "weirdness factor" inherent in Rudy's rather bizarre personal life.